Home buying: A smooth move? When you last moved house who took charge, you or your partner? I’ve been involved in some fascinating research with First Direct, revealing that couples put a combined total of 322 hours into finding, buying and moving into a new home (phew! that’s around 46 full working days!). And it’s women who are putting in more hours here, 174 against men’s 148. That can be 174 hair-tearing, stress-filled hours too, particularly when nothing happens as quickly as you’d like it to. In fact the survey found the length of time the process takes was the single top cause of stress for couples buying a new home (33 per cent). MANAGE EXPECTATIONS. Be realistic about how long it will all take and then you won’t get too stressed when things take time. BUILD IN SOME STRESS-BUSTERS. Accept this may be a stressful time for you both and plan for this, perhaps by booking a baby-sitter for an evening out, and accepting offers of help from friends and family. FIND THE RIGHT MORTGAGE FOR YOU and use a provider with a good reputation for looking after their customers. Shoddy service really adds to the stress of moving so choose someone like First Direct who’s actually won awards for customer service. You want someone who will simplify things and support you through the process, taking some of the stress away. IF YOU CAN, TRY TO PUT DOWN MORE THAN 10% DEPOSIT. Although some 90% mortgage deals are now appearing back on the market, you will pay a higher interest rate on these, so if you can stretch to a 15% deposit you will save money in the long run. TALK WITH YOUR PARTNER about your goals, fears, even the level of risk you find acceptable so that neither of you feels overwhelmed by the decision you are taking. What’s the length of your fingers got to do with your money? Hold your hand out, palm facing towards you. 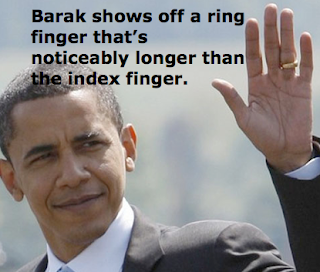 Now compare the length of your index finger and your ring finger. Which is longer? In men the ring finger is usually longer. In women they’re usually about the same length. Scientists say the amount of testosterone we’re exposed to in the womb affects the growth of the ring finger. So the male has a larger ring finger. But, of course, females get exposed to testosterone too and some have a longer ring finger (I’m one of those). (Psychologists are a weeny bit obsessed with fingers at the moment - a colleague of mine literally whooped with joy when his finger-measuring callipers arrived in the post). Now researchers from the USA* have found that females who have a more male-like finger ratio (a longer ring finger, called the 2D:4D ratio) are more likely to be financially impulsive. They tested delay-discounting ability in men and women. Delay discounting is opting for a smaller reward now rather than waiting for a larger reward. So for example, you might prefer £10 now to £11 next month. But would you turn down £10 now in favour of £100 next month? Most people would. Where they differ is in the ‘tipping point’ at which they switch from taking the reward now to opting to wait (in the example above, somewhere between £11 and £100). This is known as the k value. The psychologist Mischel first tested delaying gratification with children, offering them one marshmallow now or two if they could wait 5 minutes. Some kids just couldn’t wait. They wanted their gratification instantly. Money decisions can be the same. Lots of us would rather spend our money now than put it away to earn interest. Even though the delay would stash us more cash in the long run. Delay discounting is what separates spenders from savers. And this new research suggests, in women, a sneaky look at the ring finger might be very revealing. *Lucas, M. & Koff, E. (2010) Delay discounting is associated with the 2D:4D ratio in women but not men. Personality and Individual Differences, 48, 2, 182-186.
did you know more than 70% of relationships fail because of debt and money worries? 1. Don’t make money the taboo topic in your relationship. Open up and talk, share, commit to joint goals, look into each other’s dark corners and confront what’s there. 2. Be honest. Buying stuff behind the other’s back, lying about what you spend and secretly squirreling money away – it’s just financial adultery. 3. Be a team. Share financial decisions and problem solving. Have joint access to information, accounts and funds. Never leave one partner to do everything. 4. Be prepared to renegotiate terms if you have to adjust to tricky life transitions e.g. one of you being out of work. Having a single income might knock the budget but it shouldn’t shift the balance of power. 5. Generosity, understanding and trust are key to keeping that lifelong union going. 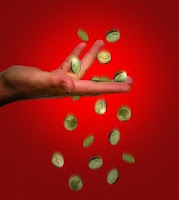 A healthy dose of these will also ensure that when money issues crop up, they don’t trip up your relationship. We’re not even halfway into Feb yet and Sheconomics has been so out there! We kicked off Feb with my www.fool.co.uk podcast on men and women investors. Next came features in Cosmo (What’s your shopping style?) and Red magazine (Cure your money sickness). 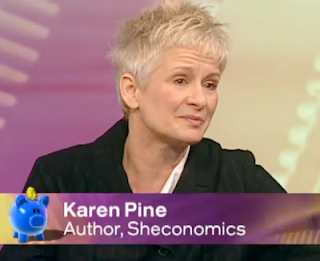 Then yesterday I was on Working Lunch on BBC2 and Radio 2 (gurning inexplicably and....) talking about couples and money (with Valentine’s Day looming*). No wonder Sheconomics rocketed up the Amazon charts this week! 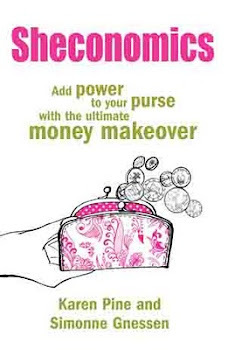 and how to use multi-tasking to maximise your money. And are you following us on Twitter yet? Do come and tweet us! I recently heard of someone who, like many women, merged her bank account with her husband’s when they got married. A few years later the marriage broke down and she discovered their credit card was actually held in her husband’s name, with her as an authorized user. Not having any recent active credit card history then worked against her and it took her two years to get her own credit card. If you have a joint account consider also having credit cards in independent names. Should I be pleased to have made it into the Top Ten Weird Money Studies of all Time? Who knows, but some of these make fascinating reading - such as taller people earn more money - although surely 'money can't buy happiness' isn't such a weird idea any more?